Kinkeldey midcentury crystal glass and brass chandelier, 1960s with faceted glass hanging from a brass frame. Fine and elegant piece. Very good vintage condition, glass undamaged. 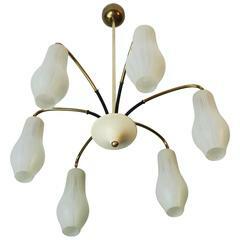 Striking Doria mid-century brass and glass chandelier with eight radiating brass arms bearing sculpted frosted glass shades. Elegant Italian Stilnovo style glass and brass chandelier. If sold to the US or Canada the chandelier will be supplied with screw-in adapters to fit standard US candelabra bulbs. 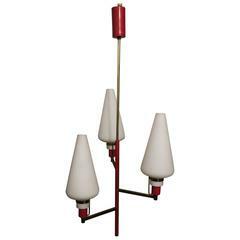 Four-tier seven-light chandelier by Kinkeldey, (Germany, circa 1960s). Socket: Six x e14 and one x e27 (Edison) for standard screw bulbs. Excellent condition. Rewired for US. 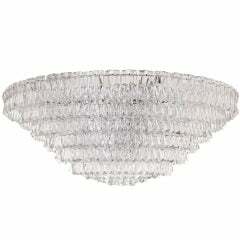 Beautiful Kinkeldey faceted star crystal prism chandelier. The frame is a beautiful polished brass and has star prisms which when illuminated gleam.